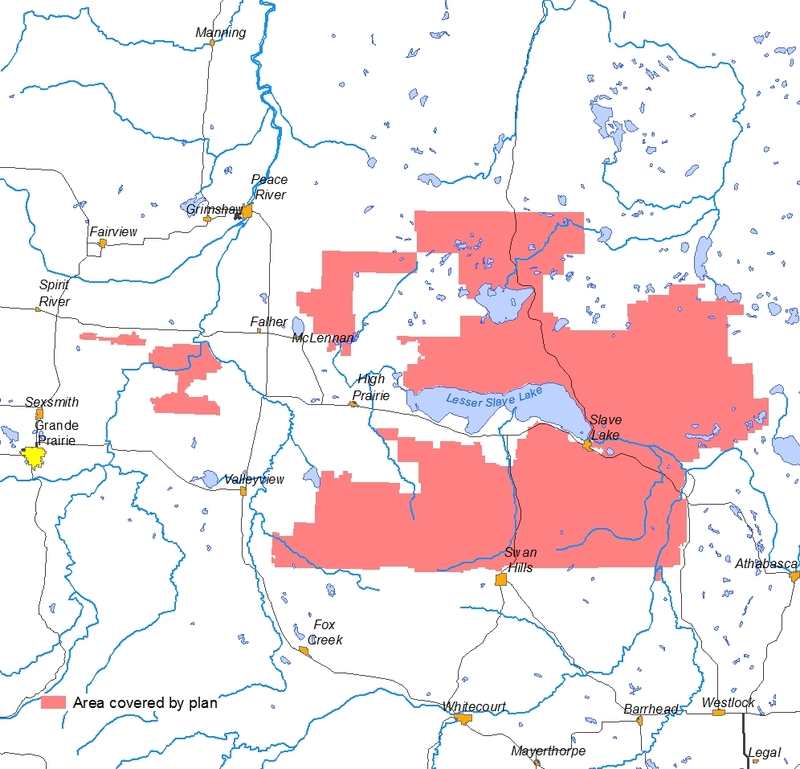 The Lesser Slave Lake Regional Forest Management Plan applies to an area surrounding Lesser Slave Lake in north central Alberta. The management area contains only Crown (public) land. Private land, provincial parks, protected areas, First Nation reserves, Métis Communities, and other non-public lands are not managed under this plan. Forested land in the province has been divided into Forest Management Units (FMU) and Forest Management Agreement (FMA) areas. FMUs are divisions designated under the Alberta Forests Act as administrative units to manage timber. FMAs are agreements between the Government of Alberta (GoA) and forest products companies that give the companies the right to establish, grow, harvest, and remove timber on the FMA area . Generally, FMA areas are comprised of one or more FMUs. However, not all FMUs have an FMA and in these cases, the GoA retains responsibility for planning. The Lesser Slave Lake Regional Forest Management Plan covers 5 FMAs and 6 FMUs. The FMU S19 has both an FMA and a non-FMA portion, while S16 is an entirely GoA managed FMU outside of any FMA. As the plan is developed, the procedure for managing these GoA areas will be integrated. The rest of the FMUs are within company FMAs and will be fully covered under the planning process.